Ribbonwood B&B | Where have the days gone? 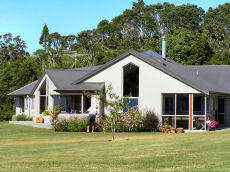 Ribbonwood was our home for two nights in Warkworth, about an hour north of Auckland. 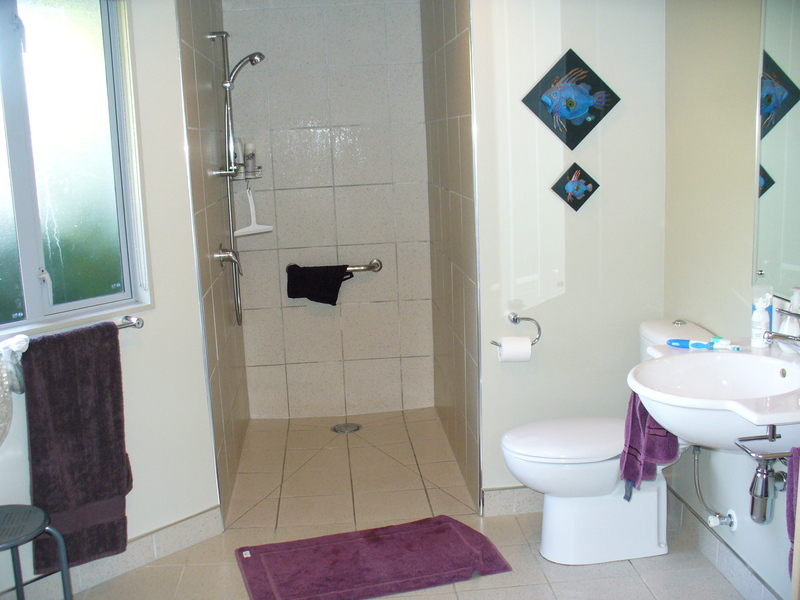 It's a very nice home, with an attached apartment as the B&B portion. 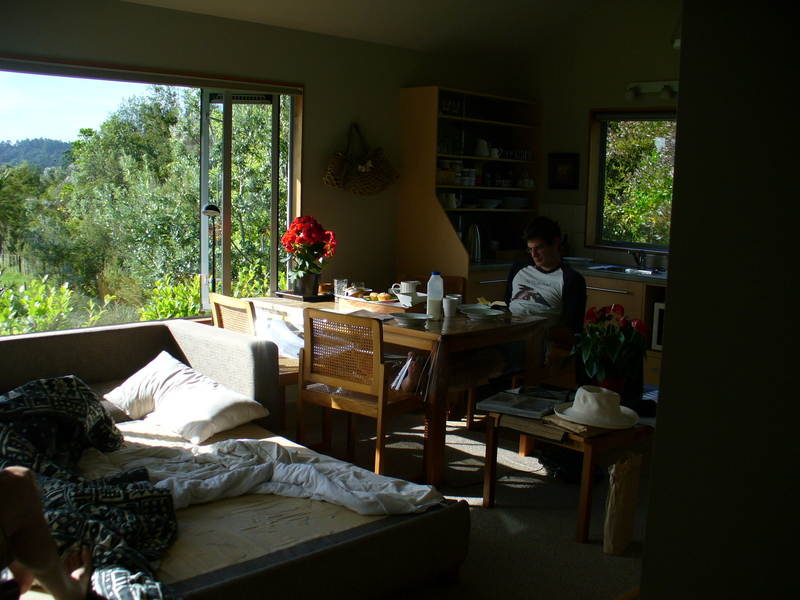 We had a living room/kitchen/dining area (with a sofa bed for Alex), a bedroom, and a beautiful bathroom. Our hosts Berris and Alan were very gracious and helpful, giving us lots of ideas of places to go and to eat, loaning us umbrellas, etc. An nice feature, especially for our first stop in a new country, was the whole bookshelf (I'm talking about 12 shelves full) of books about New Zealand, including histories, travel books, fiction by NZ authors, and more. There was also a drawer full of DVDs either about or filmed in NZ or starring/directed by New Zealanders. Also CDs by NZ artists. 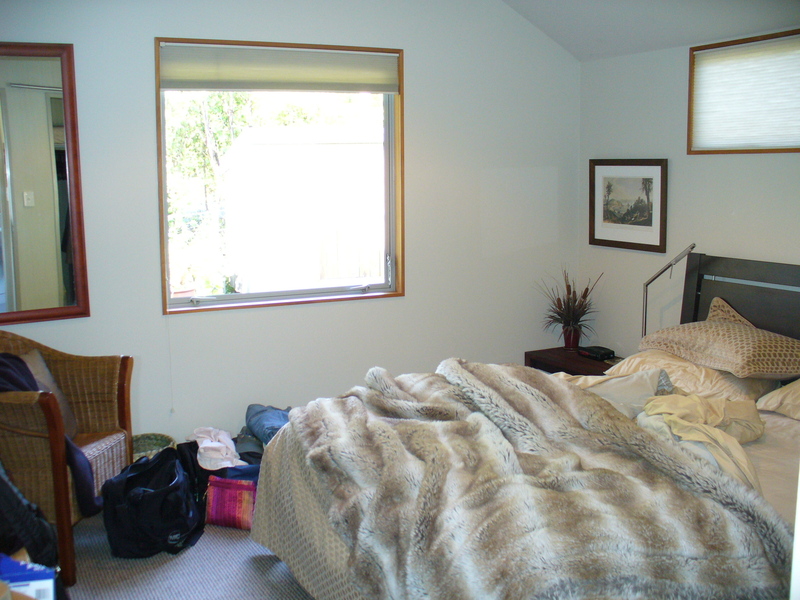 Also, while most B&Bs give you a little binder or folder with information about local restaurants and points of interest, Berris and Alan had put together a whole shelf full of binders, one with local restaurants' menus, one with brochures about local points of interest, and then more binders about other areas further away, for other travel planning. Really very useful! 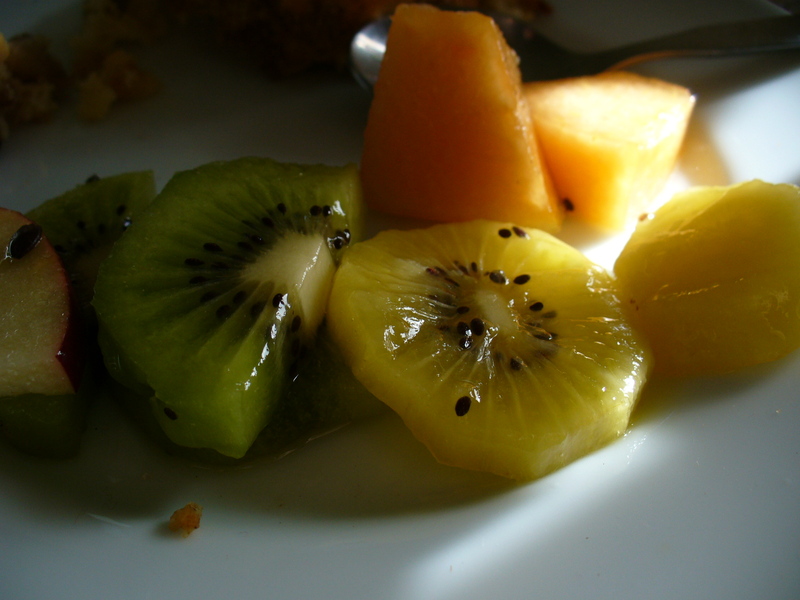 Breakfast here was cereals, yogurts, cake, juice, hot drinks, all supplied in our kitchen (so it was nice that it was available at any time), and then Berris prepared a bowl of fresh fruit each morning (including yellow kiwifruit! ), and fresh muffins the 2nd morning. The decor at Ribbonwood was really striking, with lots of items made by local craftspeople, and a really elegant taupe and eggplant motif throughout. Again, I forgot to take the pictures before we had strewn our junk all about. NZ$190 per night for the 3 of us, which was pretty reasonable, especially since we really lucked out on the exchange rate (about US$0.55 to a NZ$). Highly recommended!